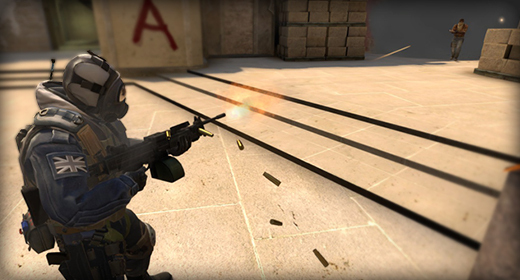 When we reworked the Negev last year, the goal was to identify a supporting role for the weapon. The Negev featured attributes that promoted suppressive fire — ineffective at first, but a controllable beam of death moments later. At this point it’s clear that the upside of the weapon isn’t enough to compensate for its downsides, so we’re making additional adjustments. The goal hasn’t changed, but the implementation is a little different. First, the good news: the Negev is now a little cheaper, a burst of several bullets is now more useful (at short and medium range, at least), and the “beam” starts a little sooner. With its improved ability to deal damage in short bursts, the Negev can be useful in closer engagements like the one pictured above. The bad news: the Negev now has lower armor penetration (no longer lethal to a helmet) and movement speed has been cut in half while firing; no more moving turrets. Want to get a sneak peek? These changes are currently available to test in a beta release, and will be live for everyone in the coming days. Click here for more details!